Chinese Language is not an easy subject for me to teach. Being an English teacher I’m more versed in teaching English and other subjects which use English as the mode of instruction. It has been an ongoing challenge for me as I try to recall what I was taught during Chinese lessons in school when I was still a student. Chinese has never been a strong subject of mine. I had Chinese tuition as a child as my parents do not speak Mandarin. Both of them learned Malay in school and were not able to guide me in the language therefore the need for additional help from a tutor. Monkey boy and his siblings have it easier as compared to me. Both his dad and me are able to speak and write Mandarin so we are able to guide him along the way if needed. R’s parents are also retired Chinese school teachers so they too are able to teach him. Nowadays there are many more resources both online and in print which can aid a child in learning Chinese. 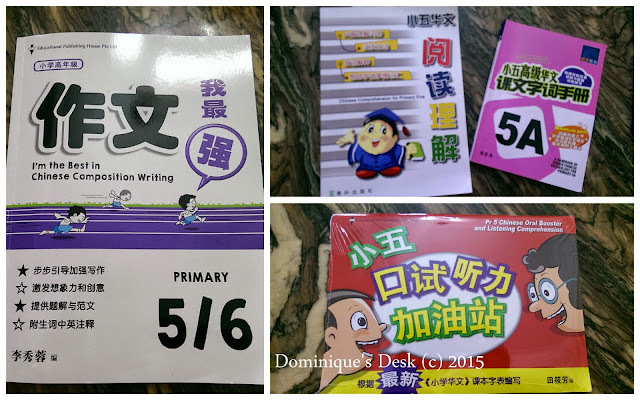 I have been using both online and print material in coaching Monkey boy with his Chinese. In the previous post on -Identifying the GAP in Chinese I mentioned that I need to beef up his vocabulary bank together with his written ability to express himself. 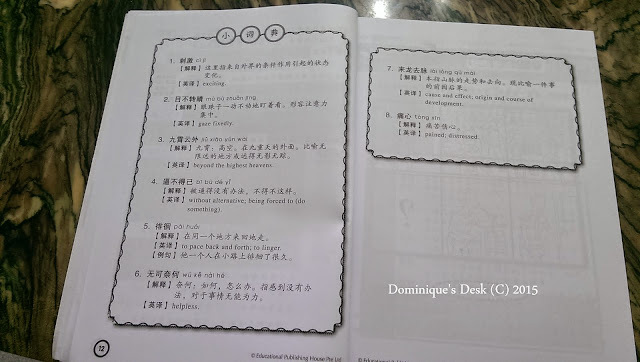 The only way that Monkey boy will be able to improve in his grades is through constant practice in both oral and written Chinese. Speaking and listening to Mandarin during Chinese lessons in school is insufficient exposure to the language. One needs constant practice to be able to both speak and write fluently in the language. Being a mainly English speaking household, I try to give the kids more opportunity to speak and listen to Chinese where possible. I borrow Chinese storybooks from the library which I read with them regularly and try speaking to them in Mandarin as often as possible. Besides interacting with them in Mandarin I do set up a schedule for Monkey boy so that he is able to get adequate practice in the areas which he is weak in. I don’t believe in cramming before a test or an examination. I feel that it is much better if the child gets constant and regular practice in a subject so that he will be able to cope with any test or exam as he does ongoing revision. The child will not be as stressed as he is confident that he has covered all the material that would be tested has been revised. I find that less stressful for the parent as there is no need to take note of all the dates for the various tests/ mock tests which are administered. I personally only take note of the dates for SA1 and SA2 as Monkey boy’s school doesn’t have CA exams. 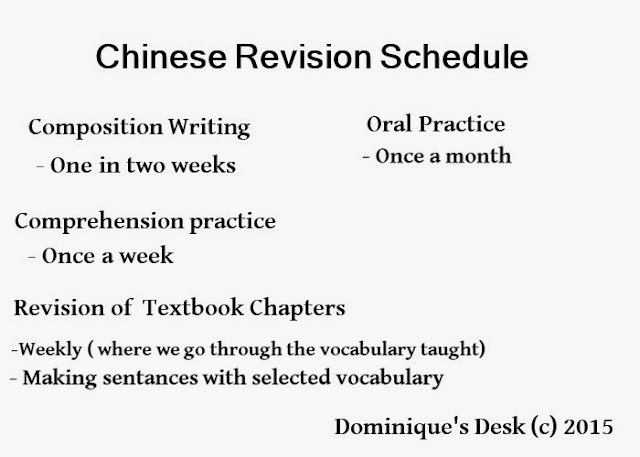 This is the revision schedule for Chinese which Monkey boy and I have set . We agreed on what we will be working on on a weekly, bi-monthly and monthly basis besides the regular homework that is given by his school teacher. As Monkey boy is doing HCL he has to be able to write a composition of 200 words or more fluently. 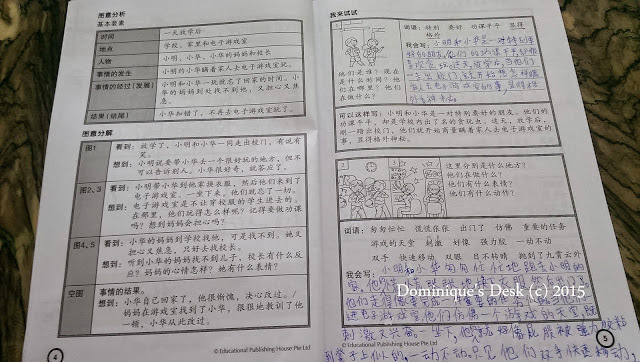 To build up his ability in composition writing I have used the composition writing assessment book shown in the picture at the top of this posts. As you can see from the photo of a picture composition above, in each exercise, focus is given on individual pictures. There is a lot of helping words given and even a sample writing paragraph given below on how to describe the picture shown above. I feel that it is a good way of teaching Monkey boy through the examples shown the possible vocabulary that can be used to describe the different picture. The 5 W and 1 H ( Who, What , Where, When, Why and How) are clearly shown together with how the picture should be analysed. It makes the child think of what can be said or describe upon seeing the picture It makes sure that every angle of the story is covered in detail. There are also suggested introduction and conclusion for the given picture composition so that the child gets a clear picture of what is expected of him when faced with that particular topic. 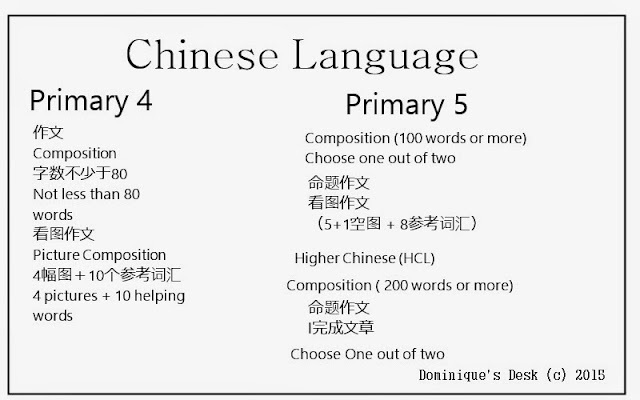 In order to score for Chinese composition the essay that is written has to be very descriptive and also fluent in expression. Knowing to use the right words in the right context would certainly help Monkey boy score well in this area. This particular book has a sample composition and a vocabulary list at the end of exercise for reference. These come in handy when Monkey boy is looking for inspiration on what to write in his own essay based on the given pictures. I will be giving practice papers and sample exam papers to complete before his coming SA exams. This would give him a clearer understanding of which areas he is weak in and also sufficient practice before the school exams. It sounds like Chinese would be a challenging language to learn. It is quite challenging as there is no basic ABC like the English language. However it is essential for the kids to learn the language to know more about their ancestors. My husband studied in Chinese School when he was young and he said that it is not really easy to learn the language. Good luck for the new challenge. I am raising my children in Beijing and feel blessed that they have the environment in which to practice their Chinese in and outside of school. I think something that is helpful is to have friends outside of school who speak Chinese so that they can talk together in Chinese. The reading and writing is something that is ongoing as I’m sure you know well. I just hope my children will continue to practice and retain their Chinese when they leave China to study abroad. I agree it is important to have friends and relatives out of school that speak Chinese too. Most of my friends do speak Chinese so I get the kids to speak to them in Chinese when we do meet up with them and their kids. 🙂 When we go out with them we try to get the kids to speak to each other in Chinese.